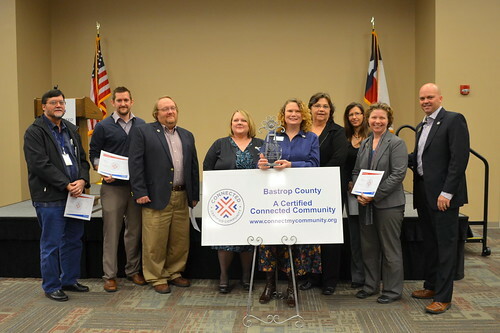 Bastrop, TX – Yesterday, Bastrop County and Connected Texas officials recognized the county as the first to become a certified Connected community in the state and 16th in the nation. More than 50 residents and community leaders attended the celebration event at the Bastrop Convention and Exhibit Center where results of the assessment and details of the new Technology Action Plan were unveiled. Bastrop County has been working with Connected Texas through the Connected Community Engagement Program to assess the local broadband landscape, identify gaps, and establish actionable goals and objectives to increase broadband access, adoption, and use for families, organizations, and businesses throughout Bastrop County. To obtain Connected certification, Bastrop County had to meet certain benchmark scores based on the National Broadband Plan that demonstrate it is a technologically advanced community. “We congratulate Bastrop County on becoming the first certified Connected community in the state of Texas. Through the Connected program, Bastrop County officials and other local leaders across Texas are working to improve the quality of life for local residents, spur economic development, and expand the opportunities afforded by broadband access,” said Texas Department of Agriculture Administrator for Rural Affairs Rick Rhodes. “We are excited that Bastrop County has achieved the Connected certification. As one of the fastest growing counties in the state, we embrace what technology can do for our citizens. Connectivity helps us do everything more efficiently, whether it’s healthcare, education, agriculture, or business,” said County Judge Paul Pape. Participating in the Connected program means Bastrop County has gone through an extensive assessment of its overall broadband and technology innovation. The Connected Assessment has culminated in the outlining of projects designed to empower the community to accelerate broadband access, adoption, and use. Bastrop’s top seven priority projects are to: complete a vertical assets inventory; develop or identify a broadband training and awareness program for small and medium businesses; establish a "digital factory;" identify, map, and validate broadband demand; implement a community-based technology awareness program; improve online business services offered by the government; and pursue next generation 911 upgrades. “Technology is at the epicenter of our economic future. Impacting everything from healthcare to education, agriculture to business – everything we do now is driven by technology. Making broadband access and technology a reality for the citizens of Bastrop County places a world of opportunities at their fingertips,” said Dave Quinn of the City of Bastrop Economic Development Corporation. The Connected program is part of the Connected Texas initiative funded by the U.S. Department of Commerce NTIA State Broadband Initiative program. Connected Texas is working to facilitate the access, adoption, and use of technology throughout the state to create a better business environment, more effective community and economic development, improved healthcare, more efficient government, enhanced education, and improved quality of life. For more information about the Connected project in Bastrop County, please contact Connected Texas Program Coordinator LaTanya Tatum at LTatum@connectedtx.org or (512) 461-4159. Photo Caption: From left, Connected Texas’ LaTanya Tatum and Don Shirley present Bastrop Community Champions Angela Ryan and Bastrop Economic Development Director Dave Quinn with the Connected certification trophy Wednesday at the Bastrop Convention and Exhibit Center. About Connected Texas: Connected Texas is a subsidiary of Connected Nation and operates as a non-profit in the state of Texas. The Texas Department of Agriculture is leading the initiative to increase broadband Internet access, adoption, and use across the state. Connected Texas was commissioned by the state to work with all Texas broadband providers to create detailed maps of broadband coverage and development of a statewide plan for the deployment and adoption of broadband. For more information visit: http://www.connectedtx.org. Also follow Connected Texas on Facebook and Twitter.